The injured young woman Michel Belanger finds in the woods is certainly an aristocrat. And in the midst of France's bloody revolution, sheltering nobility merits a trip to the guillotine. 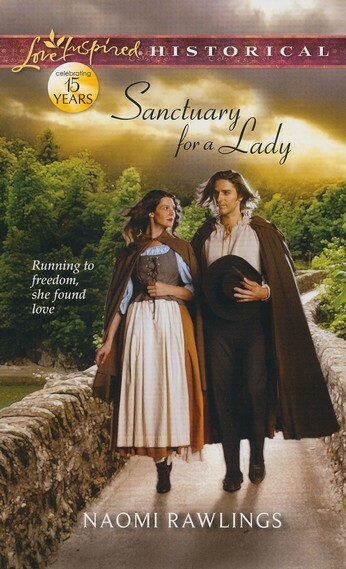 Yet despite the risk, Michel knows he must bring the wounded girl to his cottage to heal. Attacked by soldiers and left for dead, Isabelle de La Rouchecauld has lost everything. A duke's daughter cannot hope for mercy in France, so escaping to England is her best chance of survival. The only thing more dangerous than staying would be falling in love with this gruff yet tender man of the land. Even if she sees, for the first time, how truly noble a heart can be..
Before I start my review, let me just say that I was close to giving up on Love Inspired Historical books. The last six? ten? ones I read where a HUGE disappointment. I won't say which ones they were, but they had no plot, no characters, no reading value whatsoever. I was planning on not ordering another LIH book and waiting instead for Carla Capshaw's new one to come out. Then I stumbled upon this book and the plot sounded so interesting, so I decided to give it another try. The story takes place in the French Revolution, and the two main characters, the hero and the heroine of the novel, that is, are on the opposite sides of the mob. She is an aristocrat, he is one of the poor, misused peasants, with big dreams of reenge and justice. The writing was excellent, the period detail well-researched and realistic, the characters so fleshed-out that I actually missed them once I had finished reading. The romance was palpable. Sometimes I could see where it was going, sometimes I was wondering how on earth the author would manage to bring things to a satisfying end. The hero, Michel, was another picture of Christ for me. Which is probably the best compliment I can give to a fictional character. He was forgiving and caring and strong. And human. This book is not preachy. In fact, God is actually another Person in this book, almost one of the characters, rather than a long tirade about 'what the Lord would want me to do, etc...'. No. Here, He talks to people, He lifts them when they fall, he corrects their wrongs, He holds their hand when they are in trouble. The scene where Michel finds Isabelle hurt in the woods and God talks to him in spite of what his brain tells him to do... that was one of the best I have read in a long time. I reread it a few times.